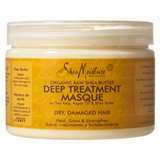 "Our all natural intense treatment masque deeply penetrates to moisturize and repair over-processed, dry brittle or damaged hair. Leave on for 5 to 30 minutes, then, thoroughly rinse, or leave in hair and use as a frizz free moisturizing styling cream." The reason why I bought this in the first place was because I was planning to do a strong protein treatment and needed a moisturizing conditioner to balance it out. My hair felt like hay after the protein treatment. I used this in my hair as a rinse out and my hair felt a little bit softer. Then I applied it again as a leave in and that's when my hair was transformed. I could not believe how soft and moisturized my hair became. This really balanced out the protein treatment ( as a leave in). It is a great styler as I use it to twist my hair. It has a lot of shine to it. It does not have any residue at all. My strands are not equal and I noticed that this helps lay down the cuticles. My twists have never looked smoother. I usually stay away from heavy products but my hair just soaked this up (after the protein treatment). I am thinking it did not weigh my fine hair down because the protein treatment thickened my hair. Overall, I give this product a 4 out of 5, only because it did not feel so moisturizing after the rinse out. However as a leave in, it is superb!!!! Update: I now use this as a rinse out for my deep treatments. I always add olive oil and honey. I do this for all the conditioners that I use for a moisturizing treatment anyway. With the added olive oil and honey, the product does an amazing job. I will keep buying because it works and it is affordable and accessible. I am thoroughly convinced. Walgreens here I come. Sure my daughter's and my hair will love this product. Hopefully it won't weigh our hair down too much. Thank you Coily BEAUTIFUL! No problem. Thanks for stopping by!! !